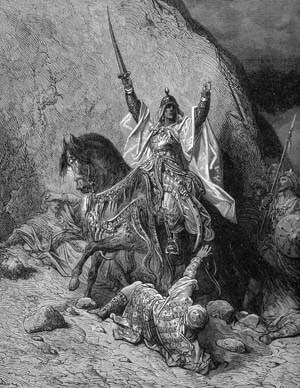 Taken by complete surprise, Saladin was defeated by his own hubris shortly after his first significant military campaign against a crusader state. In November 1177, Saladin, first Sultan of Egypt and Syria, launched his first significant military campaign against a crusader state. With 26,000 men, siege engines, a huge baggage train, and his own personal force of elite Mamluk bodyguards, Saladin marched his Ayyubid army across the Sinai Desert from Egypt into southern Palestine. Saladin’s overwhelming numerical superiority over his foe had made him confident enough to allow his troops to disperse into the vast, open countryside, where they plundered, foraged for food, and looted Christian settlements at Ramla, Lydda, and Arsuf. King Baldwin IV, who was suffering from aggressive leprosy, rapidly cobbled together his remaining forces, approximately 350 mounted knights and several thousand foot soldiers, and with the notorious Christian Prince Raynald of Chatillon in command, marched to Ascalon. There, in the face of Saladin’s huge army, Baldwin withdrew his army into the safety of the fortress, leaving the road to Jerusalem wide open. Approximately 84 Knights Templar commanded by Master Odo de St. Amand marched from Gaza to join the Christian forces. On November 25, with the roads muddy from recent rains, Saladin and the vanguard of his army were pushing east toward Ibelin. Near the rear of the column, his baggage train and siege engines became mired in mud near the mound of al-Safiya, not far from Montgisard. Suddenly, the sultan of Egypt and Syria was shocked to see a small enemy force, with Knights Templar in the vanguard, forming up on a nearby hill. Baldwin’s army had left Ascalon and marched to block Saladin’s path to Jerusalem. In his hubris, Saladin had failed to leave scouts behind to monitor his enemy’s activities. Saladin was taken completely by surprise. His army was in disarray, some of it held up with the stalled baggage train, others still absent raiding the countryside. Both his men and horses were exhausted after the long march from Egypt and their subsequent raids. Saladin raced to assemble his elite troop of personal guards—between 600 and 900 strong—while his nephew and chief commander, Taqi ad-Din, attempted to form the main body into lines of battle. Saladin tried to anchor his line on a nearby hill, but it was too late; as the Christian columns came crashing down on the confused Ayyubid ranks, Master Odo and his Knights Templar shattered the center of Saladin’s line. Unable to form ranks or mount any effective resistance, the much larger Muslim force was thrown into confusion and began falling back. Many of Saladin’s soldiers had already fled the field before the full force of the Christian charge struck; those who stood and fought were all but destroyed. Taqi ad-Din’s son, Ahmad, was killed early in the fighting, and the loss of Ahmad and other high-ranking officers disheartened the Ayyubid soldiers. Vicious fighting raged as the Christian knights turned upon Saladin’s elite force of Turkish slave soldiers and routed them as well, after which Saladin managed to flee the carnage. Saladin’s huge supply train was captured; as they fled, many Muslim soldiers abandoned their weapons, armor, and booty. Losses were heavy on both sides: Baldwin’s army suffered 1,100 men killed and 700 wounded, while no more than one-tenth of Saladin’s invasion force made it back to Egypt. The sultan’s men suffered mightily on their long, hot trek home across the desert. Bedouins constantly harassed them, and any who made the mistake of stopping in villages to beg for food and water were slain or handed over to the Christians as hostages. When Saladin returned to Cairo, he circulated the lie that the Christians had been defeated. It would not be the last time he and his armies would find themselves battling the fierce and supremely disciplined warrior monks of the Christian military orders. Tags Egypt, Jerusalem, knights templar, Odo, Saladin.